So how will Passenger Conners — she of no ride to speak of since giving up cars for city-living in 2004 — traverse the great US of A? Low and behold, I’ve bought a car; or co-bought a car, as the case may be. She’s a sweet RAV-4 that will hold all our worldly goods not currently in storage, which, for better or worse, adds up to a bit more than 2 backpacks-full o’ stuff. She’s currently chilling in the wilds of Connecticut (hey, parking in NYC’s a pain!) until we’re ready for take-off. Alas, the RAV remains nameless. I’m hoping she’ll earn her moniker in due time — though if you’re struck with a suggestion, please send me the skinny. I hope she’ll fall smoothly into the role of a good, ahem, third wheel on our travels. If all goes according to plan, I imagine you’ll be seeing quite a bit more of her. WOW…..the location of this beautiful photo looks vaguely familiar. 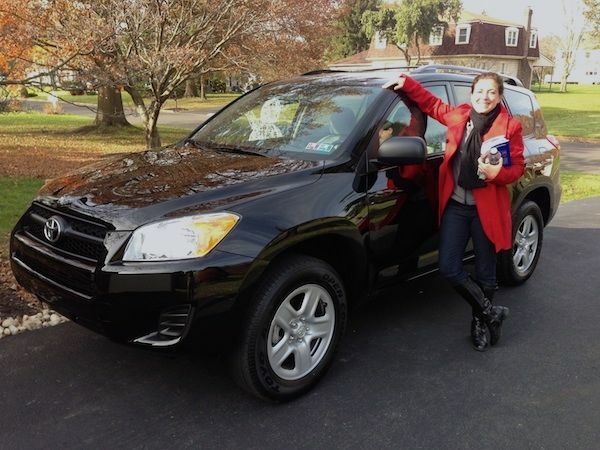 Love your new wheels….safe travels luv!!!! Congratulations on the decision to hit the open road for an extended period of time (look forward to following your journey). It’s a shame we never got to meet at a Restless Legs, but who knows? Maybe our paths will cross one day! Ah, how I missed this comment earlier, I’ll never know. Dang! I’m not in the city again until next week. That being said, if you are heading out of town and find yourself driving past the Jersey shore or want to take a pit stop in Asbury Park, let me know! Another adventure, can’t wait to read about it. Love the car. You look beautiful, as always.